Roger Federer walked onto Centre Court at Wimbledon to begin his title defence at The Championships, drawing oohs and aahs before striking a ball. The Swiss, who had worn Nike for his entire professional career, has a new look, sporting Uniqlo apparel. But the tennis remains vintage Federer, as the top seed began his pursuit of a ninth championship at the grass-court Grand Slam with a straightforward 6-1, 6-3, 6-4 victory in 79 minutes. He will face runner-up Lukas Lacko, who ousted Frenchman Benjamin Bonzi, in the second round. "I'm very happy. I felt good from the start, too, which was nice," Federer said. "I felt right at home again, so it was a really nice feeling. Got the early break in each set and was able to bring it home." Federer is now 67-6 in first-round matches at Grand Slams, including a 17-3 mark at the All England Club. The 36-year-old’s most recent opening-round loss at a major came at 2003 Roland Garros against Luis Horna. There is plenty of history on the line this fortnight for Federer, who is attempting to become the first man in the Open Era to lift five Grand Slam trophies after turning 30. 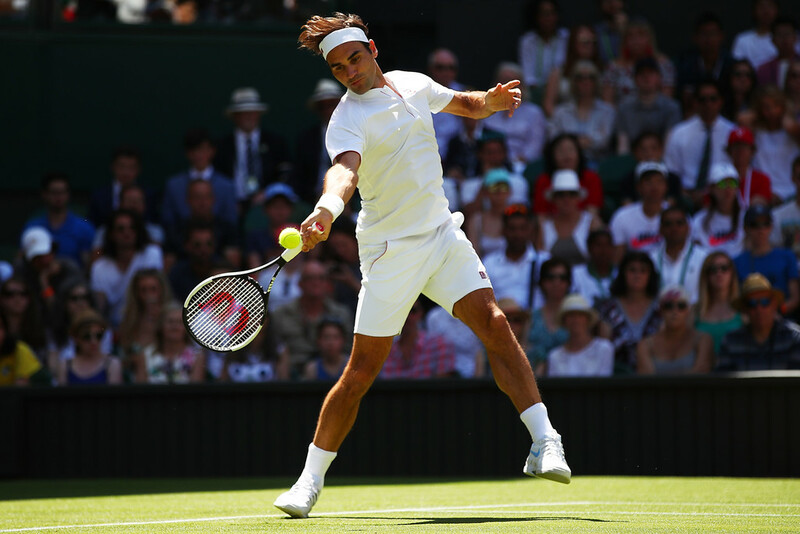 The first man in the Open Era to make 20 consecutive appearances at Wimbledon, Federer is also trying to extend his record to nine titles at the event. Despite all of his success, Federer spoke at his pre-tournament press conference on Sunday about the nerves he still deals with when beginning his title defence on Centre Court. A year ago, in the second round, the Swiss even fell behind 0-2 against Lajovic. But Federer showed no nerves at all against the 28-year-old, breaking the Serbian’s serve five times without facing a break point himself to oust Lajovic for the second consecutive year. Federer now leads their ATP Head to Head series 2-0, without dropping a set. "I was really able to enjoy the match out there because I got off to a good start. When you get off to a good start in set one and two, you're able to just enjoy the moment more than when you're struggling early on," Federer said. "There is always pressure and nerves when you go into a first round." The World No. 2 is now 9-1 this grass-court season, after claiming victory at the Mercedes Cup for the first time and advancing to his 12th Gerry Weber Open final, where he lost to Borna Coric in three sets. This is his sixth straight-sets victory on the surface this year. And whereas he lost the first seven points of his match against Lajovic at Wimbledon last year, Federer got off to a much quicker start. After the Serbian held to open play on Centre Court, the Swiss won nine consecutive games. Federer continuously put pressure on his opponent, going after his shots and attempting to move into the net. Whenever he got a short ball or saw Lajovic switch his grip to hit a slice, Federer quickly swooped in, winning 23 of 28 (82%) net points. "I also watched some of the match I played against him last year. My legs were really not moving," Federer said. "Took me faster than six games to figure everything out. Court played great. It's wonderful. Wonderful to be back here." To nobody's surprise, the eight-time champion was dominant on serve, losing just four first-service points. Lajovic, however, was able to capture just 59 per cent of first-serve points. The first seed Federer could have played, No. 32 Leonardo Mayer, is out. German Jan-Lennard Struff overcame a two-set deficit to defeat the Argentine 3-6, 6-7 (5), 7-6 (5), 7-6 (5), 6-1 in three hours, 29 minutes.